Immigration is clearly an issue that divides the nation. Who should be allowed to stay in the US? Who should have to go? Whether you support immigration or oppose it, the backlog in our nation's immigration courts will disturb you. People who shouldn't be here, get to stay for years and build a life while they wait. And those who do legally deserve to stay may have family in danger back home, while their cases face delay after delay. 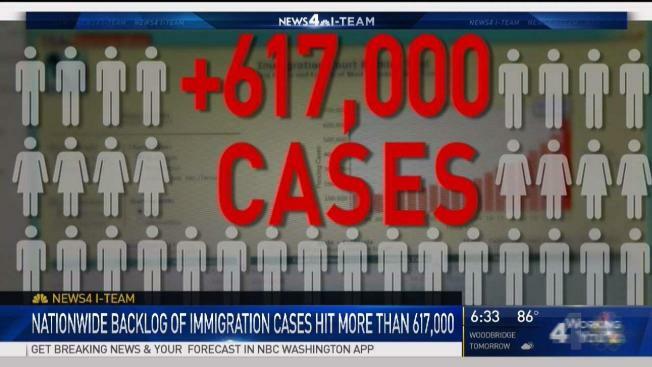 The News4 I-Team spent months working with NBC investigative teams across the country to examine our nation's immigration case backlog. In Washington, D.C., Maryland and Virginia the number of cases has more than tripled in past five years, with some cases taking more than four years to be heard. "The quality of their lives are deeply affected by whether or not they're allowed to stay," said National Association of Immigration Judges President Dana Leigh Marks, adding that the decisions are incredibly tough. They often involve people who faced violent assaults, religious persecution, even government oppression and torture in their home country. "The cases that we hear, they are death penalty cases," said Marks. "A lot of people tell us that they fear for their very life if they're sent back to their home country." And by the time many of them make it into a courtroom, their definition of "home" has likely changed. Jonathan Claros was born in El Salvador, but his home is now Montgomery County, Maryland. "I consider myself American. I know some people are against that," he said. At 29, he's been here almost half his life. He taught himself English, graduated from high school in Gaithersburg and works in construction. "This country is made of immigrants," Claros said. "It doesn't matter what color they are, or race or ethnicity." What does matter is whether you come here legally. Just last month, ICE deported Jonathan's brothers, the youngest was a 19-year-old soccer star who was set to start college on a scholarship. "They came here when they were little. They know better this country than where they were born," Claros said. Their parents and sister are all in Maryland and equally worried about the current state of the U.S. immigration system. "What they're doing right now for me is, you know, it's devastating," Claros told the News4 I-Team. "A lot of families have been separated from their loves." Three years ago he married a U.S. citizen and filed paperwork to get legal status. "It's been kind of hard; it’s been almost a year waiting for an answer," he said of the delay. The nationwide backlog of immigration cases topped 617,000 this summer. The courts in Arlington and Baltimore handle all of the cases for D.C., Maryland and Virginia -- more than 58,000 of them as of July. And that doesn't even include immigrants who are here illegally and completely undocumented. The News4 I-Team found a new immigrant walking into the Arlington court today could have to wait until December 2021 for a hearing; that's the second longest delay in the nation. "It's a disaster. I think it's moving toward implosion," said Judge Paul Wickham Schmidt, who retired last year from Arlington's immigration court, after 13 years on the bench. "We probably had 9 to 10,000 each on our dockets," said Schmidt. "I think sometimes we minimize the difficulty of having your life on hold." He said the system is painfully slow for several reasons, and the first is really basic: The entire system operated on paper. With no way to e-file cases or review briefs or documents online. "They don't let you see the inside of an immigration court. If they did, they'd clean it up! But there are files piled all over: They're in the corridors, they're all over the desks, they're under desks," said Schmidt, who can speak freely since he's retired. He said judges have to physically be in their offices to review files, which is especially difficult with a new administration policy that reassigns some judges to hear cases at the border. That leaves courtrooms empty back in their home court and a full docket of cases that get pushed to the back of the line. During the delay, witnesses who could help the immigrant's case might disappear, and attorneys and judges could move or retire, causing more delay. "The cases that are actually ready to go are being put to the end, and the judges are being assigned to cases of recently arrived individuals, many of whom haven't had time to get lawyers. So I think it's a misuse of resources," said Schmidt. He said there aren't enough attorneys to keep the system moving, and having representation significantly impacts someone's chance of staying. The new administration has also eliminated prosecutors' discretion to dismiss or delay thousands of low priority cases: People who haven't committed a crime or have family members who are citizens. "There's only so much judge time," said Schmidt, "and if you use it for people who are low priorities, then there's some other person who isn't getting a hearing." He added that with political priorities constantly shifting, judges should have control over which cases to call first. "Unfortunately despite our best efforts, there are people being hurt by these delays, and they can be avoided if we would get sufficient resources," said Judge Marks. She said the court needs twice as many judges to tackle that backlog. But right now, the court's budget and its management are within the Department of Justice, which is another major issue for the judges association. "The way to assure stakeholders, the people who come before us, that they are being treated fairly is that we should be taken out of the Department of Justice and made a neutral court system," said Marks. She said Congress needs to look at the whole system and take action so the political climate surrounding immigration doesn't impact whether or when people get their day in court. "It is not a Democratic or Republican issue," said Marks. "If you want to have increased focus on the border courts, fine. But build courts, hire judges and put them there before you start that program." The Justice Department told the News4 I-Team it's committed to increasing the number of judges; an additional 65 judge positions are already budgeted for next year. But that still doesn't solve the problem of dozens of vacant positions, and sitting judges retiring. There's also an agency-wide review already underway which aims to identify ways to increase efficiency, through changes to court procedures and technology. The DOJ's Executive Office for Immigration Review, which manages the court system, says its mission is to fairly, expeditiously and uniformly interpret and administer the nation's immigration laws. Like Jonathan Claros, nearly half of all of the immigrants caught in the backlog in our area are from El Salvador -- more than 28,760 people. But Judge Schmidt said the courts do not treat all nationalities equally. "The law is sort of tough on Central American cases. Some of them can make it, some of them don't," said Schmidt, "An Ethiopian with an asylum claim, they almost always get granted." The court data shows the location also factors into whether an immigrant has a better chance of being able to stay. The national average is just over 56 percent. Here in the D.C. area, it's 61 percent. Los Angeles is 70 percent. "Clearly, the attitudes of the judges and how they feel about asylum law has quite a bit to do with it," said Schmidt, "If I were an immigrant, I'd rather be in California than Atlanta, Georgia. Any day." In one Georgia court, only 13 percent of people are allowed to stay in the U.S.
Schmidt said the appellate boards also lack consistency in their decisions. "As a result, judges don't get the guidance they need. The board doesn't crack down on judges who are way out of line with what the law should be," he said, adding that immigrants deserve to know their fate sooner. Our system simply doesn't allow for that. Schmidt said with the volume of cases, the gravity of his difficult decisions was often emotional. "You're not going to get every single one right, and you think about the lives that you might have destroyed that you could have saved, and of course that weighs on you," he said. Jonathan Claros said he still believes in the American dream. He's just worried his family's heartache will keep growing while he waits for an answer. "Everybody's afraid," he said. "They go out, but they don't know if they are going to come back home again. It's hard to live like that." Reported by Jodie Fleischer, produced by Rick Yarborough, shot and edited by Steve Jones.